We are very happy to announce our client Pirate’s Quest 2017 Halloween Adult’s Only Fright Night is once again a sell-out event. This year some eager members of the Flamingo team are even helping to scare those brave enough to enter! The annual intense scare experience is back after a successful Halloween in 2016 with the theme ‘Ghost Pirates’. 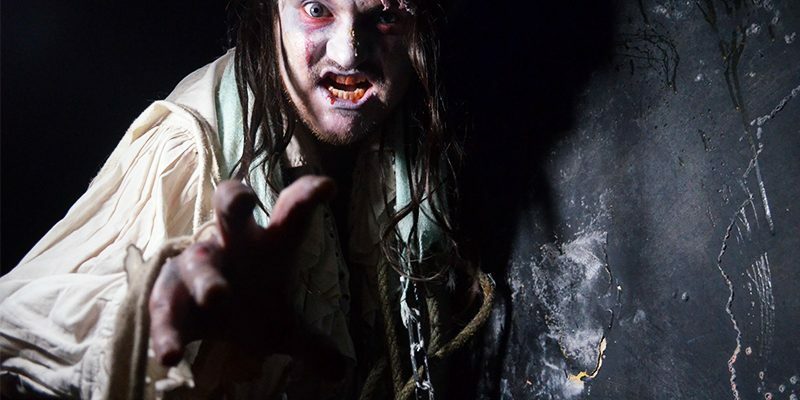 Horror fans are in for a treat as the authentic caves and coves inside Pirate’s Quest will be transformed into gruesome scenes filled with deranged, disturbed, and diseased characters, creating Newquay’s only fully immersive, walk-through SCARE experience. Using a cast of skilled scare-actors, detailed 360 degree sets, and shocking special effects, the after-hours Halloween experience at Pirate’s Quest is guaranteed to get you screaming! Visitors will summon their courage as they navigate their way through the dark and dank scenes, and come face to face with terrifying pirates who aren’t afraid to get up close and personal. So don’t stay in and watch a horror movie, live the experience yourself at Pirate’s Quest! Due to popular demand in previous years, for the first time ever groups with teens will be able to attend our Twilight Teen Terror Tours, with limited slots running from 6pm on Friday 27th before the main scare event. Keep an eye on the Pirate’s Quest social media channels to see how the characters looked on the night!